Today, I’d like to welcome Michaela from The Sphinx Project by Kate Hawkings to the blog! 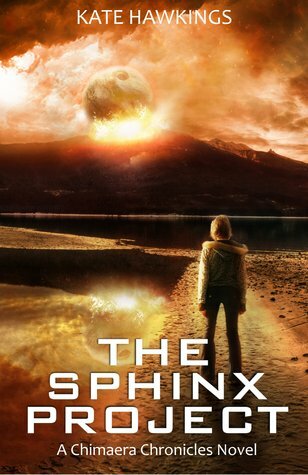 I just finished reading The Sphinx Project, and I loved it! You can check out my review HERE. I asked her some either/or questions as to what she would prefer. Welcome Michaela! BREA: Michaela, do you prefer being by yourself or with others? MICHAELA: It’s hard to decide because I’ve never really had much time to myself. I’ve managed to steal a few moments here and there since we left the labs though, and I’ve really enjoyed the peace. MICHAELA: I’ve never tried coffee, but it smells nice! MICHAELA: Motorbikes, they just makes me feel free. BREA: Rock music or pop music? MICHAELA: To be honest I don’t know the difference… I’ve liked all the music we’ve listened to though. BREA: Going to stores or ordering online? MICHAELA: I’ve not bought anything online before, but Mouse has. It seems so much easier. BREA: Cake or ice cream? BREA: Movie theatre or DVD? MICHAELA: Book… I’ve seen a couple of magazines since I got out, but they all seem to be about clothes. BREA: Dressy clothes or casual clothes? MICHAELA: Casual. I really don’t understand the frilly and lacy bits on the dressy clothes. I like to be able to move around without worrying about what I’m wearing. BREA: Sleep in or get up early? MICHAELA: Early. I like seeing the sun rise. MICHAELA: I don’t think I’ve tried Mexican, but I did get to try pizza. It was awesome! BREA: Which would you rather lose, you hair or your teeth? MICHAELA: Hair, I could always wear a wig. MICHAELA: I’ve never had money of my own, I can live without it. I’d take love any day. BREA: Fly or read minds? MICHAELA: Hmm, both could be hugely advantageous… On one hand I would always know what my opponent are going to do next. On the other, I would be able to get a proper view of our location and see things coming from miles away. Although it would probably be more sensible to choose mind reading, flight just tugs at me! BREA: Lose your sight or hearing? MICHAELA: Sight. My hearing would be more beneficial than my sight if I were only to have one of them. Thanks so much for visiting with me today, Michaela! I really enjoyed your story, and can’t wait to see what happens to you next! For those of you who haven’t picked up The Sphinx Project yet, you should! It’s great!